Due to certain twists and turns in fate and real estate, Cathouse FUNeral’s distinctive gallery walls have been harvested from its former East Williamsburg location in an ex-funeral home and reconfigured as “gallery-objects” in Chelsea. Including work harvested from Brad Benischek's 'Ghost City' (May 2015), Anne Deleporte's 'My Favorite Horror Show: the news' (May 2016), and several group and solo shows by David Dixon. 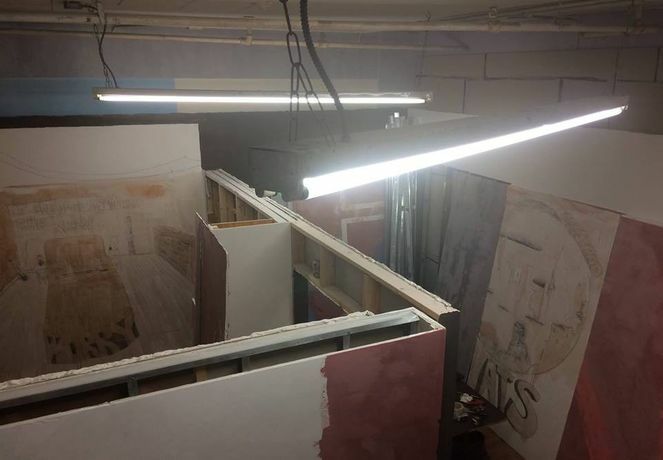 Due to certain twists and turns in fate and real estate, Cathouse FUNeral’s distinctive gallery walls have been harvested from its former East Williamsburg location in an ex-funeral home (the building has been sold for development) and reconfigured as “gallery-objects” in Chelsea at 132 10th Avenue. Along with these three room-sized installations hang many of the gallery’s “harvestings” that have been extracted from the design conditions of the space over its three-year life. Cathouse FUNeral was never returned to its original white walls, rather, the space accumulated layers of color, design, murals and fresco over its twenty group and solo exhibitions. Not every show produced a harvesting – nor were they intentionally made – but when one presented itself, it was duly removed and preserved. There are now over thirty harvestings. This attitude toward relic, history and transformation has led to the entire gallery space being deconstructed and reconstructed (Frankenstein-like or like Osiris) in an empty and available gallery space in Chelsea. Each of the three gallery-objects is freestanding, arranged and composed of multiple sheets of plastered and painted gypsum board.